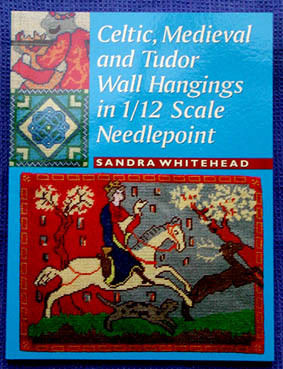 "Here is a superb collection of designs for wall hangings inspired by art and tapestry. Miniaturists and embroiderers alike will delight in stitching these 1/12th scale designs which take their sources from our rich cultural heritage. All designs are simplified to suit the canvas in 22 and 24 count. These miniature tapestries can be framed as pictures, displayed on wooden easels or hung as if in a miniature baronial hall. They make ideal decorations for dolls’ houses but their intricacy and attention to colours and detail make them fascinating features to display in their own right.". carpets for a Tudor mansion". Copyright 2009 Knight Time Miniatures - All Rights Reserved.